Spending your day on the southern end of Amelia Island? When hunger strikes, it’s good to know that the Sandollar Restaurant is slinging fresh seafood at bargain prices. Perched on the edge of the St. John’s River, the Sandollar Restaurant has been a favorite among locals since 1988. Enjoy views of the river as the ferry and other boats putt along the coast. But the deck isn’t the only spot to enjoy the view. The Sandollar Restaurant’s indoor dining area is positioned behind some super tall windows, making any seat in the house the best seat. If you’re from the south, you probably already know what a ‘hushpuppy’ is. If not, there’s no better way to get introduced than with an order of Sandollar’s famous sweet, deep-fried hushpuppies. The cornmeal is hand battered and deep-fried until golden brown–these will disappear fast! As you may have guessed, Sandollar Restaurant specializes in seafood. With its close proximity to the water, you can actually see the shrimp boats that caught your meal–none of that frozen stuff! And you call the shots on how you want your seafood prepared. 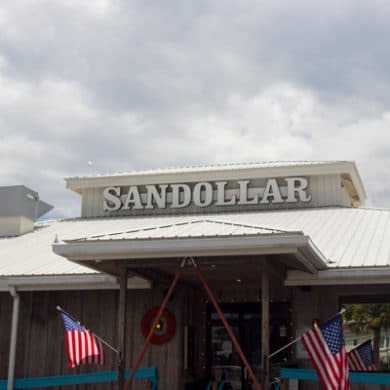 Whether you like your seafood fried, grilled or blackened, Sandollar has you covered. All seafood entrees are served with more of those famous hushpuppies–you’ll be ready for more–and two sides of your choice. Not a fan of seafood? Don’t count yourself out yet, because the Sandollar Restaurant has a wide variety of burgers, pasta dishes and top choice steaks to choose from. There truly is something for everyone! Prepare to shake a leg and cut a rug, because the Sandollar Restaurant has live music on the outdoor deck during the weekends–as long as those pesky rain clouds cooperate. Order another drink and enjoy the view at the Sandollar Restaurant. The Sandollar Restaurant is located at 9716 Heckscher Drive Jacksonville, FL 32226. For more information, visit the Sandollar Restaurant website or call (904) 251-2449.